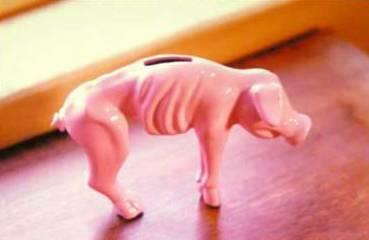 I filled up my car today and this is how my piggy bank now looks. Sad isn't it. I never thought I would see the day when it cost me $40 to fill up my Honda Accord. Thank God it gets good gas mileage. Laura and I do a budge each month and it's sad cause we are now having to budget in gas when before we didn't. I remember when I first started driving (1989) I could fill up my entire car for $10. Now, $10 just tops off your tank. It makes me so sad when I see the pictures coming from New Orleans and Mississippi and Alabama. It's like a bad wreck. I want to look away, but my eyes keep looking at all the destruction. One question. Why didn't they evacuate the residents before the hurricane??? They were told it was going to be bad. They should have gotten everyone out of the cities and to safe ground. It's a little late for the hundreds (probably thousands) that lost their life. It's sad that it's the people that could not afford to get out of town or did not have any transportation to leave are the ones that have suffered the most. I think about all the people that were in nursing homes. What have happened to them? The pictures are devestating. So, I can only imagine what it's like to be looking out and seeing it for yourself. Say a prayer for all of the south. It's going to be a long, hard road to try to clean up the cities that were destroyed. It's going to be months, even years before life will get back to normal, if it ever does. Happy Monday. We had a good weekend. Laura's nephew welcomed his first child into the world. Little Landon is adoreable and it was nice finally meeting him. As many of you know, from the time I played with dolls and make believe families, I have always wanted children. Many of my friends from high school are very surprised that at 32 I don't have any children yet. I remember playing the game of "Life" with my cousins and I would literally buy their children so I could have more children. Having a baby has always been something that I have dreamed about. Then reality hit. It is so much responsibilty. It is nice being able to sleep in on the weeknds, decide at the last minute to go do something. When you have a child your whole world is centered around this child. Then put in all of this the child having two gay parents. How fair is that to the child. The world can be so mean and so hateful. It would kill me if a child of mine suffered because of me. And Kansas City is not real diverse and is not real open to "alternative" families. Then there is the part of me that says Our love and the love of our family would be enough for this child. If Laura and I were to have a child it would be one of the luckiest babies in the world. It would have one parent who is a social worker and one who is a teacher. Plus, it would be the most loved baby. When two gay people decide to have a baby, it's not something that just "happens". It takes a lot of planning. Obviously. It makes me sad to think that we can't just say, "opps, look what we created". Laura and I have had several discussions about a baby. She has more of a foot in reality in this regards then me. She is worried about the prejudice this child would suffer and about the money and time it would take to raise just ONE child. And I am more in another world. I tell her, "our love is enough for this child". Only time and God knows what the outcome will be. On another note, my brother and his wife are due to have their third child in about a month. This will be #4 for my brother. His first child is from his first marriage. These are two people that need to be permentantly fixed. Don't get me wrong, I love my nephews. My brothers first wife has more of a head of her shoulders then his second wife. ( I knew she was smart when she left him) My two youngest nephews and the nephew due in September have a tough road ahead for them. It's situations like this that make me angry. It's not fair that these two people who have NO business have babies are allowed to just keep popping them out. They can't even support themselves, let alone 4 kids. Some things don't make sense, and never will. Today is Friday, Thank God. Laura has gone back to school and so our time together is limited. She is up and out of the house by 6am and then I don't get home until after 5pm. That gives us about4-5 hours together for the day. Summer was wonderful. It was so nice having her home during the day when I would come home for lunch. She made up for all those times I got up early to make her lunch by always having lunch for me when I came home. Even though our summer got off to a rough start with the car wreck, it was a good summer. The car wreck reaffirmed our love and admiration for each other. After the truck hit us all I really remember is spinning on the highway. That day she was wearing an orange "Life is Good" t-shirt. As we were spinning I remember seeing her shirt spin around and around. I remember thinking, "Oh my God, I don't want to loose her". As we were spinning I knew where we were and that there was going to be something that was going hit us. As we were spinning, Laura turned to me and put her hands on my face. When we were in the emergency room that night she asked if I remembered her putting her hands on my face. At that time I did not remember. She said that she thought we were going to die and she wanted me looking at her when that happened, not what was going to hit us. I love that she was concerned about what I was going to see during that very chaotic moment. The wreck made me realize that I never wanted to spend a day without her and that I would fight til the end for our love. And she thinks she is the lucky one. This was sent to me today by a dear friend. I love this cartoon. Hope you also enjoy it. Here is an interesting website that have scaned copies of different JW literature. The particular article that I think is interesting is the one about disfellowshipping. Go to www.jwfiles.com Once you are there look on the right side and look under the heading Watchtower Society's Control. Once there go there blocks down to the article Watchtower's View of Disfellowshipping. This is an actual scan of an article that is discussed in Kingdom Halls. Believe it or not, I remember going over this article in 2002. Pay special attention to the part about adult children who are disfellowshipped and not living at home. Intersting to say the least. In June 2000 I was disfellowshipped (kicked out) from the church the first time. It was because I was smoking and refused to quit. After I was disfellowshipped the first time is when I actually started dating women. I remember meeting with my Dad that summer and telling him about my relationship with this particular woman. He wasn't upset at all. My Mother was never told. She wasn't talking to me so I didn't tell her, but I found it very surprising that my Dad didn't say anything to her. After I was reinstated ("allowed" back in the church) in 2002 I started seeing this woman again that I first saw in 2000. Usually when someone is reinstated (which is a huge process which usually takes 6 months to a year) they are over the top with JW or Watchtower beliefs. When this relationship started up again I was feeling so guilty. Guilt is the main core of JW's. When the elders reinstated me I had to have a weekly Bible study with a "spirtually mature" individual in the congregation. So, I started meeting with Melissa every week. She was the first one I went to when I was feeling guilty about these feelings I was having. She told me that I should talk to the elders about this. I called one of the elders that was on my committe for reinstatment and asked him if we could talk. We ended up meeting at Melissa's house one Saturday to have this discussion. This elder, Melissa and I sat around and talked. I didn't know that this elder had called Melissa to find out what I wanted to talk about. (Elders hate to be surprised and thus unprepared) He came with all these materials about homosexuality and how it was "vile" and "disgusting to God". After this meeting I of course felt like crap. My self-esteem was so low that it barely existed. I went and talked with my Mom. I was honest with her about my feelings. Anyone knows my Mother knows how she reacted. She went crazy. She was screaming at me about, "how could you do this to me.." Wait, who said this had anything to do with her? She just didn't get it. She went in her bedroom, locked the door and stayed there for 3 days. Upon urging from my Dad I told her that I no longer had those feelings and it was in the past. Bam..everything was "perfect" again. After that talk with the elders Melissa no longer allows me to be near her 4 year old daughter. She goes out of her way to make sure her daughter does not go near me. I say something to my Mom and she says I am probably being overly sensitive. Fast forward to June 2004. I was in a good, loving relationship and the happiest I have ever been. My Mom is picking up on the clues and is asking a lot of questions. I deter her for as long as possible and finally on July 4 I tell her the truth. (no it was not planned that I would come out on Independence Day, just happened that way) This time I am not backing down. I tell her she can react any way she wants, but this is who I am. During this final phone conversation with my Mom she says, "now do you understand why Melissa didnt' want you near Katie." My insticts were right. Because I am openly saying I am attracted to women it must mean that I am attracted to all females regardless of their age. Give me a break. I have never been so insulted in all my life. And the most hurtful thing is, that insult came from my Mother. It just shows you that not everyone is born with motherly insticts. I have never had a child, but my motherly insticts are better then those of someone who has been a mother for 34+ years. I love this picture. Makes you wonder why animals that shouldn't get along, get along just fine. 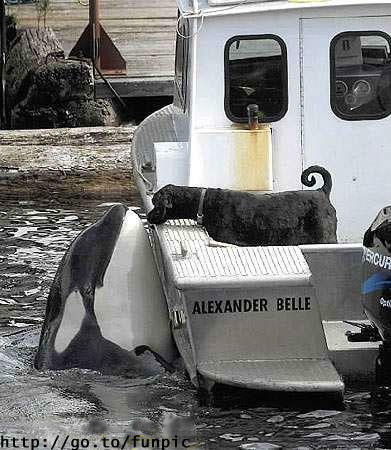 I love how the whale is just as curious as the dog. A picture definitely says a thousand words. Equal Rights. What does that mean? We live in a country where every person is suppose to have the same rights. But think about it. There aren't two people that have the exact same rights. How can we say we live in a free country when I can't walk down the street holding my partners hand? I can't lean over at dinner and give her a soft kiss. We are afraid of offending others that aren't open to our love. We cherish the times when we are in an environment where people don't care. That usually means we are in another city. We spent 2 wonderful days in a small town in Arkansas that is very diverse. I know, when you think of diversity, Arkansas isn't the first place that comes to mind. It was the first time in our relationship when we were in public and we felt like we could be ourselves. All of our affection is only shown when we are in our own home. We just recently went away for the weekend and when we left the little Mom/Pop motel we made sure that both beds were unmade when we left. Why? Heaven forbid they realize we were a gay couple and slept in the same bed. If we were a heterosexual couple this would never have been a thought. In our country if you're married and your spouse dies you are not taxed on what you inherit from them. As a gay couple who is not able to legally marry anything we inherit from our partners is taxed very high. How would it hurt the country if we were able to legally marry? You allow Britney Spears to marry someone for 48 hours, but you don't want homosexuals to marry because you want to preserve marriage? We deserve the same rights. The end. For so many years I was a very angry person. I was being told how to act, what to think and who I was. I was struggling with myself and fighting this inner war. Something had to give. For so long I thought that the thing that had to give was me. I was an unhappy miserable person. But each day that I walked out the door I put on a mask to hide the real person underneath. I put on the mask of a well behaved Jehovah's Witness. I once had taken the exit off the JW highway, but realized that I was not prepared to be out there on my own in a world I knew very little about. I quickly found another entrance ramp into the world of a Jehovah's Witness. This was what I knew. It's like driving down the road of your childhood home. I knew everyone that was around me and I was comfortable. It was like a slow drive on a Sunday afternoon. Not much action, just a lot of sight seeing along the way. But deep down inside I was miserable. I didn't understand why being myself was such a sin. Why wouldn't God love me if I was gay? I even thought that maybe I was a mistake and that if God could he would take back me ever being created. But wait, God doesn't make mistakes. Even Jehovah's Witnesses teach that. So God could not have made a mistake in creating me. I was meant to be here for a reason. And maybe that reason was to shine the light on the unloving acts that are happening in Kingdom Halls around the world in the name of JEHOVAH. I don't want revenge, I was justice. For those 3 elders that sat there telling me that God would not love me once I was disfellowshipped. Thankfully I did not go through years and years thinking God did not love me. I have had several situations where the message that was sent from God was, "I love you". I have now gotten off the Jehovah's Witness road. My life is wonderful and complete. When someone enters into a cult they don't always make it out. I have known several people that were JW's and then left, but they weren't gone for long. Being connected with Jehovah's Witnesses make you dependent upon them. They want you to think you can't make it on your own. Believe me, you can make it on your own. I almost guarantee that your life will be a lot better. Always remember that God is LOVE. God never makes a mistake and he loves each and every one of us. NO QUESTIONS ASKED. Yesterday was your birthday. I did not talk to you. But I haven't talked to you in 13 months now. Did you think about me? I did think about you. I thought about what you were like when you were a newborn. Thoughts of you as a newborn seem unreal to me. It's hard seeing how you could be innocent and pure. The only side of you that I have seen is the one that has been tainted and unclean. By the time I met you your own way of thinking was already gone. I just realized I have never known the real you. Not the one that you think you should be. But the person that you were born as. I wonder if I would like that person. Maybe one day I will find out. But my guess is I will never know that person. Maybe when your soul is cleansed by Jesus I will finally see the real person. Maybe I will finally meet my Mother. I am commited to my partner. She is my world. She is the reason I get up in the morning. I love having someone that I wake up to that everyday I learn something new about her. There isn't a day that goes by that I don't look at her and see that twinkle in her eye and know why I am in this spot at this exact moment. It was a hell of a road getting to her, but the journey was well worth the reward in the end. And because of that I will forever be commited to her. The year was 1999. I was what I thought was happily married. Yes we had our problems, but didn't everyone? We had both just graduated from college and things were looking up. Then someone came into my life that would change it forever. At first I thought this attraction was just a liking of the person. I admired her for all the hard work she was doing. But then it went deeper. The deeper it went, the more it changed me. I realized that I am not the person I thought I was. For the first time I was admitting (to myself and others) that I was attracted to a woman. My life would never be the same again. Looking back I wonder why I was not more scared. It was almost as if this weight had been lifted off my shoulders. I felt light again and felt like I could move around again. For the first time in my life I felt like I was alive. I felt I was being the person that God had created. Now six years later it is amazing all that I have come through. All the discoveries of my self and who I am. It's been an adventure. But one that I wouldn't change for anything. Now I know what true happiness is. And I know that my happiness should be the first thing in my life. I can't make anyone happy and I can't love anyone unless I love myself first. I am gay. I am proud. And I once was a Jehovah's Witness. I realized I was gay when I was married. It was about 6 years ago now. That is when the show Queer as Folk first went on the air. I wished my mind had been more open then because I think watching that show during my struggle would have helped me. I just started watching QAF last year. Last night as I was watching the finale it was as if I was saying goodbye to a new friend. I had just gotten to know the characters and now they are gone into history. I used to be ashamed that I was gay. I was raised that way. If you think differently or look differently, then there is something wrong with YOU. I fought my feelings for women for so long until it was literally killing me. The first time I kissed a woman I knew this was how it was suppose to feel. I never felt that when I would kiss a man. I felt like "yes, this is who I am." And who I am is someone that loves women. That does not go well when you belong to a religion that forbids homosexual relationships. I was told either you chose God or you chose your sinful life. Two things here..first of all, I should never have to chose between something and God. God is always with you. Second, my lfiestyle is not sinful. Many JW's marry before it is legally alright for them to marry. Is that a sin? My gay home is filled with love, respect and honor. I don't see that very often in heterosexual homes today. I created this blog for all those people struggling with their faith and their sexuality. You need to know that you are perfect the way you are. And always remember God made you gay. And God loves you. I look forward to this self-discovery and I pray that my previous struggles will help others when it seems the whole world has turned on them.